Gross Revenue Index grew by 9.5 percent in the fourth quarter of 2018 as all industries continue to expand during the period. Private Services posted the fastest growth with 10.0 percent. This was followed by Manufacturing with 9.9 percent; Trade with 9.6 percent; Finance with 9.1 percent; Real Estate with 8.6 percent; and Transportation and Communication with 5.9 percent. Total Employment Index inched up by 1.5 percent. Industries with the fastest growth in employment were Trade, with 3.3 percent growth and Transportation and Communication with 3.2 percent. Other industries with growth in employment were: Private Services with 2.6 percent, Finance with 1.5 percent, Electricity and Water with 1.2 percent, and Manufacturing with 0.7 percent. On the other hand, employment index in Real Estate and Mining and Quarrying declined by 0.1 percent and 6.9 percent, respectively. Total Compensation Index increased by 5.9 percent. Private Services recorded the fastest growth with 10.3 percent. The rest of industries also recorded growth in compensation index: Real Estate with 6.9 percent; Transportation and Communication with 6.6 percent; Mining and Quarrying with 3.9 percent; Trade with 2.8 percent; Electricity and Water with 2.5 percent; Finance with 1.4 percent; and Manufacturing with 1.3 percent. Meanwhile, Compensation per Employee Index grew by 4.4 percent. Industries which recorded growth were: Mining and Quarrying with 11.7 percent; Private Services with 7.4 percent; and Real Estate with 7.0 percent. On the other hand, Trade and Finance declined by 0.4 percent and 0.1 percent, respectively. At constant prices, Total Compensation per Employee Index declined by 1.5 percent during the period. 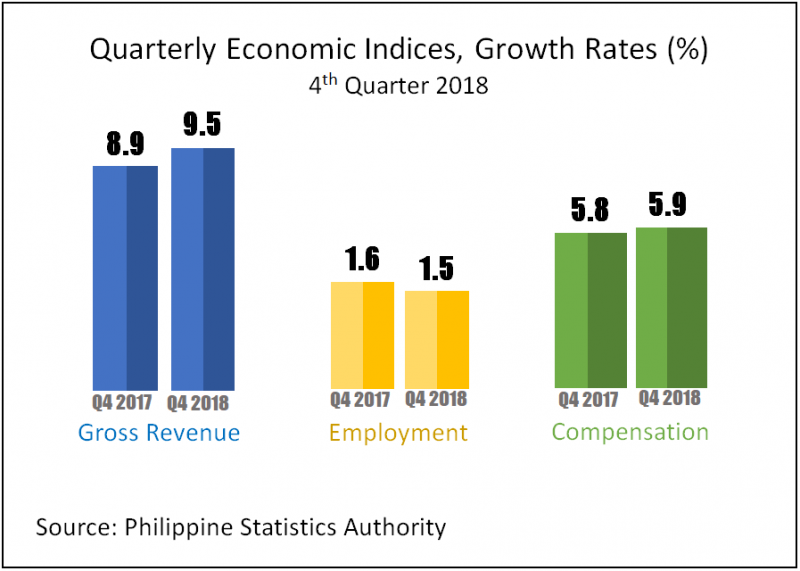 This report is based on the March 2019 issue of the Quarterly Economic Indices (QEI) of the Philippines. For the technical notes, please refer to http://psa.gov.ph/qei-press-releases/technotes. See more at the Quarterly Economic Indices (QEI) landing page.